Rodney Kimberley Greenard GANT is a bit of a mystery. He was born in July 1901 in Ipswich, and registered in Sept Qtr 1901 as Rodney Kimberley GREENARD. According to the IGI, he was the son of Edward Marshall GREENARD and Jessie Susan WARNER. Edward and Jessie are on the 1901 census in Ipswich with several children – no Rodney of course, as he would have been born later that year. Jessie Susan GREENARD’s death is registered in June Qtr 1906 in Ipswich, and according to the IGI, Edward Marshall GREENARD died in 1917 in Thunder Bay, Ontario, Canada. At least 2 of the older children also died in Canada, so they may have gone with Edward after Jessie’s death. No problems so far… except that Rodney uses the surname GANT, not GREENARD. 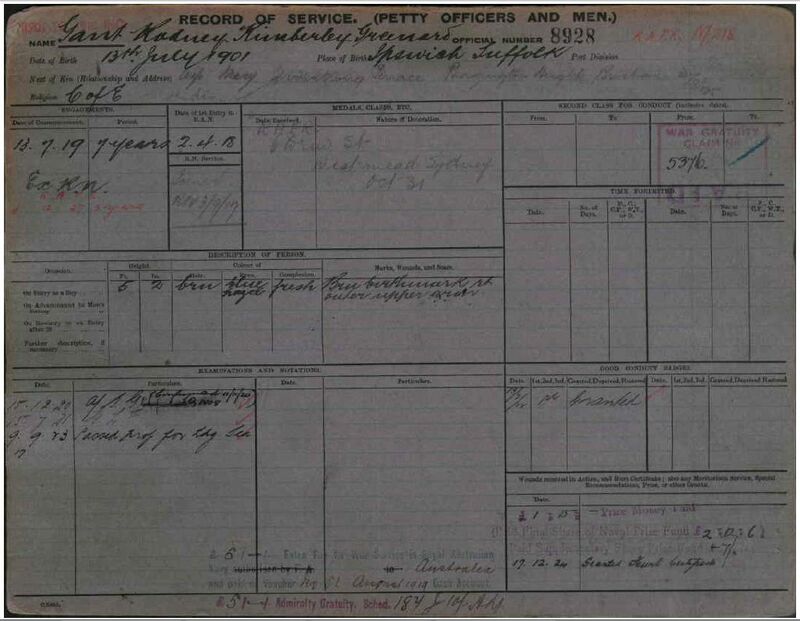 Rodney’s Navy Service Record Card (shown above) clearly has his surname as GANT. Rodney Kimberley Greenard GANT married Mary McNiece NISBET in 1924 in Brisbane, Australia. Maxwell Rodney Greenard GANT was born in Brisbane in 1927, presumably the son of Rodney and Mary. Rodney Kimberley GANT and Mary McNiece GANT are listed on the Australian Electoral Rolls between 1930 and 1936 in New South Wales, Australia. Rodney Kimberley G. GANT died in 1961 in Parramatta District, New South Wales. His parents’ names are shown on the index as George and Lucy – not Edward and Jessie as would have been expected. So the question is – why GANT, and who are George and Lucy? I can find no record of a suitable George GANT marrying a Lucy, otherwise I would have assumed that Rodney was taken in by a George and Lucy GANT after his mother died. More research is definitely needed. Rodney Kimberley Greenard added the Gant out of respect to his Maternal Uncle George William Gant married to lillian Howe Gant nee Cowan on entering the Royal Navy as a Boy after his Mother died. Never adopted but the name was carried on.